Well, I started this month off with a Transformers review; might as well finish it with one. I know, another Transformers review, and so soon after the last one. I’m blowing your minds, aren’t I? Okay, probably not, because I’m a little bit predictable, and I very clearly spelled out at the end of my Optimus Prime review that I really wanted a bunch more. Getting a bunch more was kind of inevitable. At least, that’s what I keep telling myself. 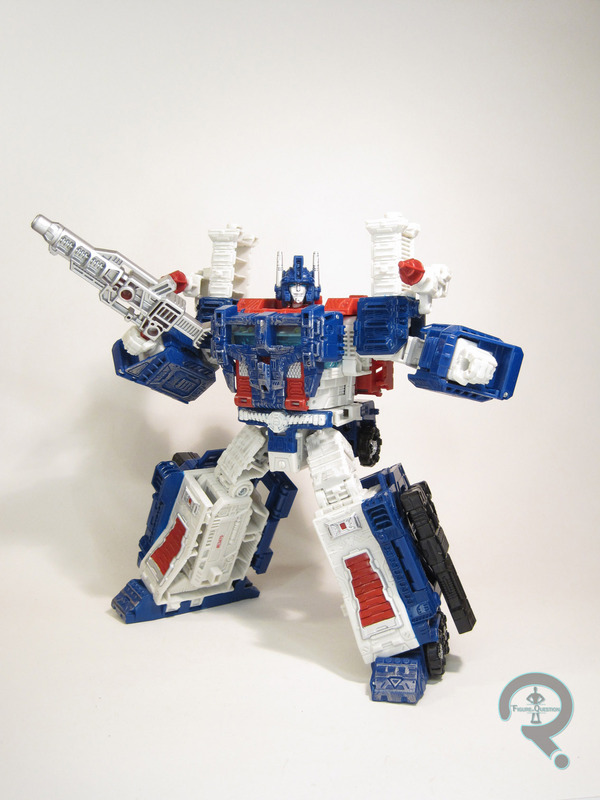 Today, I’m looking at the inevitable counterpart to any Optimus Prime, Ultra Magnus. A prominent fixture of the brand since the G1 days, Magnus has many times been an easy way to get extra milage out of Optimus Prime/Convoy molds (and has, on one occasion, actually been related to Optimus in continuity). And now, he’s my newest Transformer. Yay! 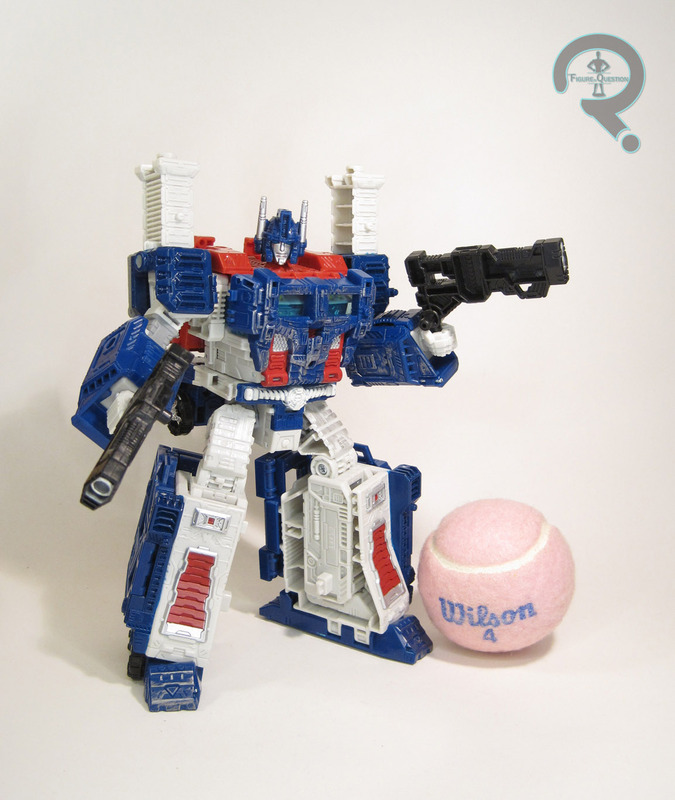 Ultra Magnus is one of the two figures in the first Leader Class wave of War For Cybertron: Siege. As with the others in this line, he’s very much G1 inspired, at least in his robot mode. Said robot mode has Magnus standing 7 1/4 inches tall and gives him 20 practical points of articulation. He may not be quite as mobile as Prime, but he sure is chunkier. I mean, like a lot chunkier. Magnus’s gimmick back in the G1 days was that his main look was the result of a bunch of armor pieces that all assembled over the much smaller inner-bot, a gimmick that this figure brings back, for the first time since the original, in fact. The fully assembled look is what gives Magnus his more distinctive character, and clips in place and holds together like it were just a fixed part of the figure. It’s also designed to attach in such a way that it doesn’t really hinder the figure’s movement all too much when he’s all kitted out. Obviously, the sheer bulk causes a slight limiting factor, but he’s still quite posable. Where Optimus’s main look was made up of lots of clean lines, Magnus is a little more complicated and fractured, which is ultimately pretty true to the two respective characters. There’s plenty of small detail work going on here, and I particularly dig all of the little intricacies of the armored parts. The armored-up look results in a very chunky silhouette, especially when viewing Magnus from the side, but this feels pretty true to the character. It’s at the very least a consistent bulk, so there’s no random bits of his vehicle mode just jutting out of the back. When it comes to alt-modes, Magnus has not one, not two, but three. 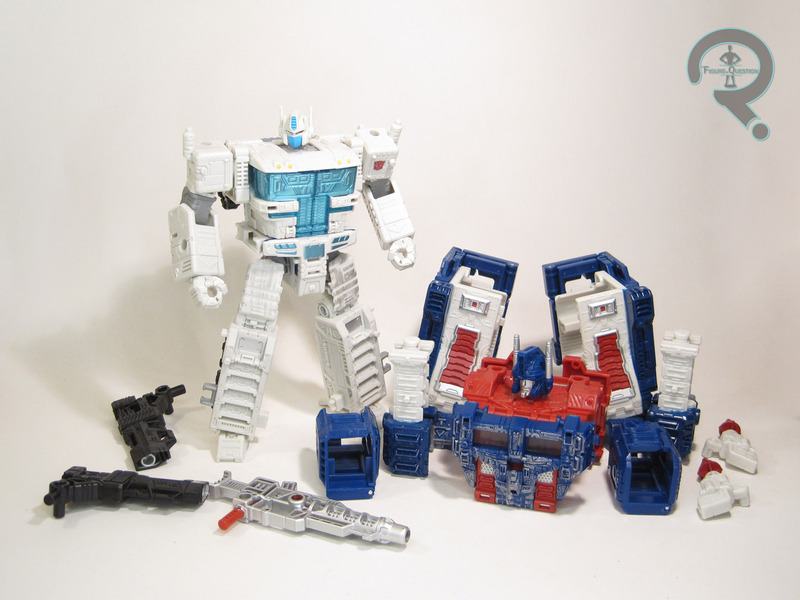 The first one (which you’ll need to transform him into in order get to the other two) strips him of his distinctive Ultra Magnus armor, revealing an almost all-white Optimus Prime- looking figure, with some blue accents, just like Magnus’ original figure. It’s *not* the a re-use of the Voyager Class Optimus, which is somewhat surprising, and actually kind of cool. How often does Magnus get to be the original? The mold has already been tagged for a Leader Class Optimus, set to be released over the summer, but Magnus gets to be unique until then. It’s a solid sculpt of its own. I really appreciate the differences between this and the Voyager Optimus. There are a few oddities I’m iffy about, like the front wheels just sticking off of the back, and there being a few rather obvious screws, but it’s still a pretty well-crafted figure. Ultimately, I can’t see myself displaying him this way anyway, so it’s not like it’s a big deal. Switching between armored and unarmored is pretty easy, and even a relative novice like me didn’t have any real trouble. Ultra Magnus’ next mode is his primary vehicle mode, which, it should be noted, is the one bit of this figure that’s *not* G1-inspired. He still turns into a truck cab, but this one is very clearly modeled on Magnus’ vehicle design from the 2001 Robots in Disguise cartoon. Seeing as that cartoon was my introduction to Magnus, I can definitely dig it. Magnus’ transformation into truck felt a lot easier to me than Optimus’, though I’d imagine that’s to prep you for what comes next. 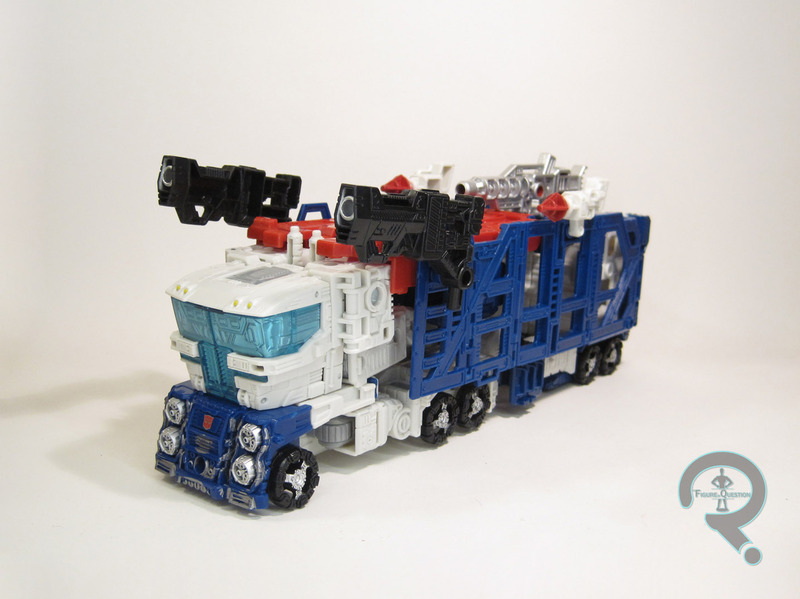 After removing his armor and transforming him into a truck, the third alt-mode has you add the armor back on, this time in the form of the truck’s trailer. This set-up also follows the RiD model, though it keeps the colors of the G1, obviously. I found this portion of the transformation to be the most difficult, as there are a lot of bits that all need to clip together, and they had a tendency to fight me and not want to go where they were supposed to. Fortunately, they come back apart without too much trouble. Magnus is armed with three different styles of weapon. He’s got his RT-15 Stethoscopic Detector (the rifle), a pair of C-30 Magnetic Inducer Launchers (the smaller guns), and a pair of W-HV-1000 Simulacrum Blasters (the rockets on his shoulders). They’re all using the 5mm ports, so they can be held or plugged in various places, and they are also compatible with the effects included with the battle masters. This is Max’s fault again. At first it was less Max’s fault, because how was he to know that I’ve always had a soft spot for Magnus, and specifically a soft spot for RiD Magnus, and that mentioning the RiD-inspired truck would lead me to want this figure. Then it became more Max’s fault when he decided to buy his Magnus early from another store, and volunteered me to buy the one on order for him from All Time “since I was planning on grabbing one anyway.” I mean, yeah, I was, but is that really the point? …Okay, yes it is, but, still. Whatever the circumstances that led to me getting Magnus, I’m very happy to have him in my collection, and I even more look forward to getting more of these guys. So, as you may have guessed, I picked up Magnus from All Time Toys. 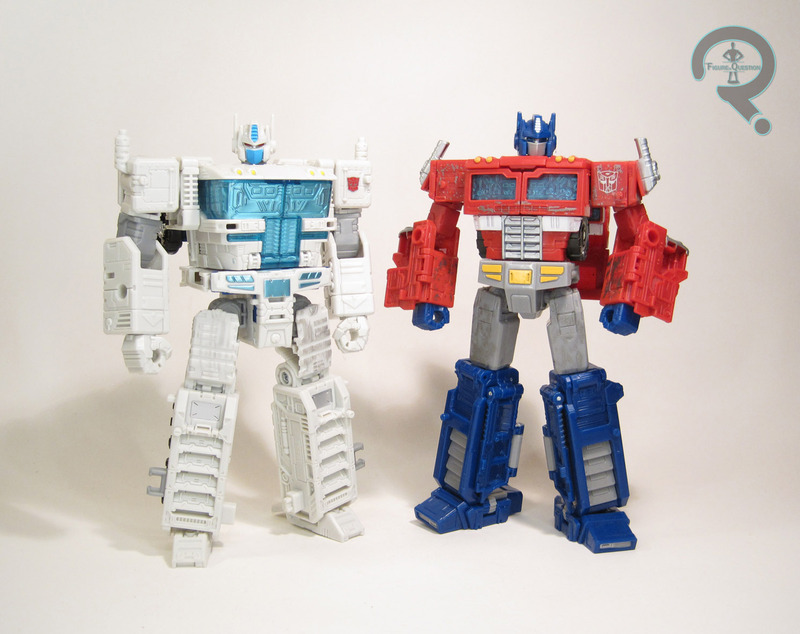 If you’re looking for Transformers, or other toys both old and new, please check out their website and their eBay storefront. 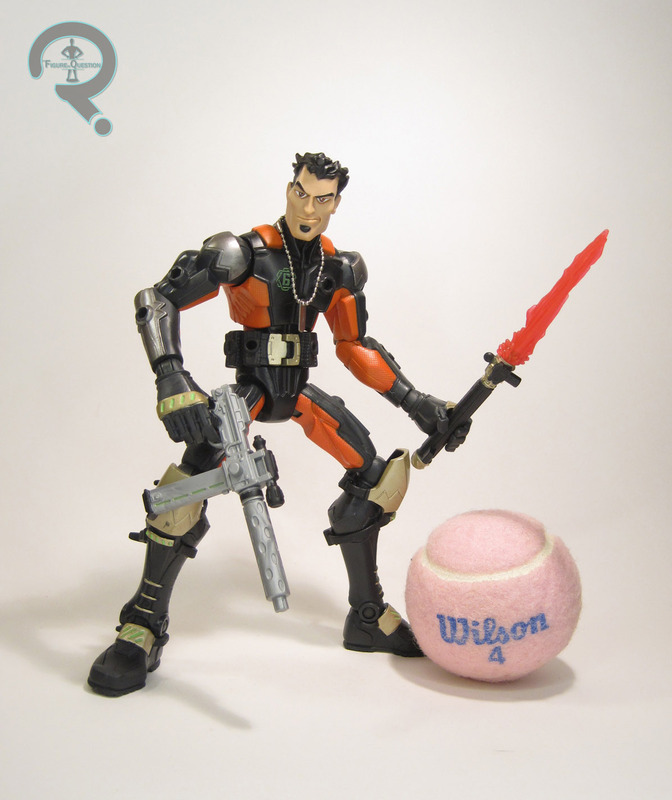 When Hasbro first launched their Titan Heroes concept, most toy collectors balked. Cheaply-made, all plastic 12-inch figures? What kind of a collector market is this meant for? Well, the answer is: none. They were purely aimed at being a cheap toy for parents to buy you kids, without having to worry about scolding little Johnny about breaking his $20 Black Series figure. And, if the masses of Titan Heroes and similarly-themed competitors visible at retail are anything to go by, I’d say it was a pretty successful move. Mattel tried to get in on that success with a couple of similar lines based on the licenses under their banner. By far the most successful has been their running DC line, which has most recently been based on Justice League Action. It’s gotten us an interesting assortment of characters, including today’s focus, Booster Gold! 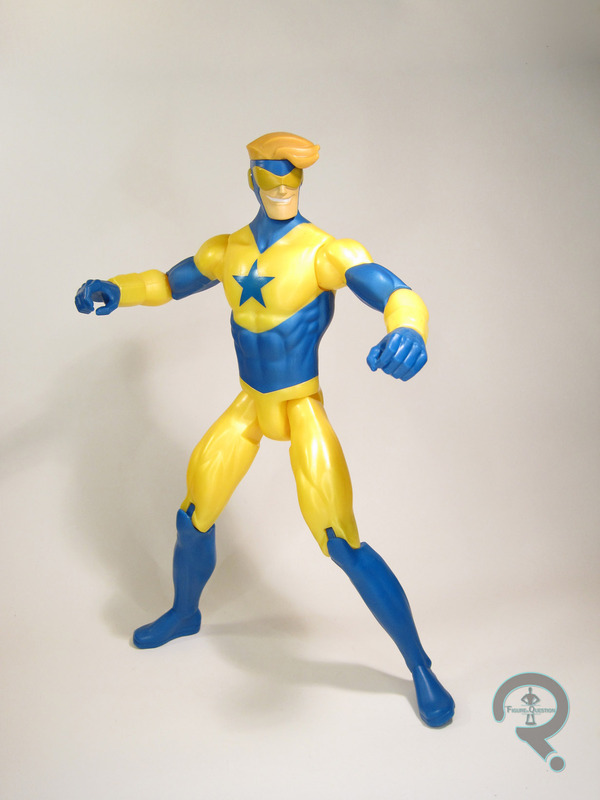 Booster Gold was released in the larger scale Justice League Action line at the beginning of 2018. Based on the post-52-inspired costume of the cartoon, the figure stands 12 inches tall and he has 17 points of articulation. He’s more posable than a Titan Heroes release, but still feels a little bit restricted; the lack of ankles is kind of throwing me. Still, you can get some decent poses out of him, so there’s that. The sculpt is decidedly more rudimentary than a lot of figures (though, honestly, not too far removed from Mattel’s higher end product from around the same time), and rather skinny and lanky. The legs in particular seem rather long for the body. The same basic body is shared between figures in this line, and while I can see it not being a very good fit for a lot fo characters, it’s not terrible for Booster, especially not Booster from the show. It’s also largely hollow, meaning it feels very lightweight, and could potentially be prone to breaking, though I myself had no issues with it. Booster’s head was a new piece, and it’s an alright one. It’s very stylized, very blocky, and very sparse on the details. It’s not very accurate, though. I mean, it’s not *unlike* Booster on the show, but it’s certainly squarer and a little less expressive. That being said, it’s not a bad piece, and does still read pretty well as Booster Gold, big dumb grin and all. Booster’s color work isn’t all that much done with paint, but instead relies heavily on molded colors. For a kid-aimed line, it’s a sensible choice, and it works out alright. What paint there is is fairly cleanly handled, and the figure is bright, colorful, and eye-catching, which are the most important things. Booster has no accessories, not even his robot buddy Skeets. Booster without Skeets seems very odd to me, but that’s the path Mattel chose. This is why the lost the DC license. No Skeets. I’ve not really followed this line at all, apart from seeing the odd figure in various toy aisles. I stumbled upon Booster while out looking for some last minute Christmas decorations. 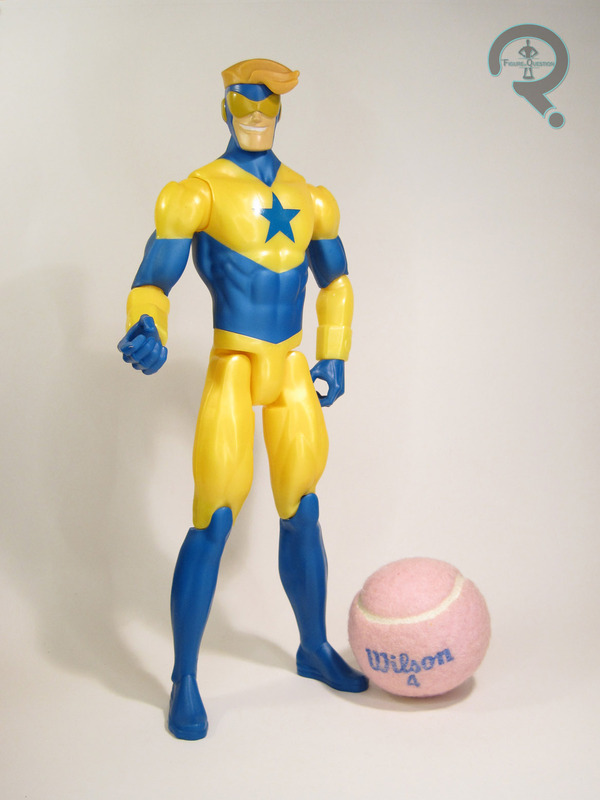 I wasn’t really looking for him, but who am I to turn down a Booster Gold action figure? He’s not amazing or particularly notable or anything, but he’s not awful, and for the discounted price I got him for, I quite enjoy him. Even if he doesn’t include Skeets. Accessibility is always a major concern with long-running brands, and Star Wars has always wrestled with the best way to keep their most prominent players consistently represented and available to an all-new audience. Pretty much in tandem with that, Disney is working to keep the Star Wars universe fresh and on-going while still giving new fans a chance to get up to speed. Put them together and you have Galaxy of Adventures, animated re-tellings of old-school Star Wars stories, with a toyline of heavy hitters to match. Today, I’m diving into the line with a look at “The Scoundrel”, Han Solo! 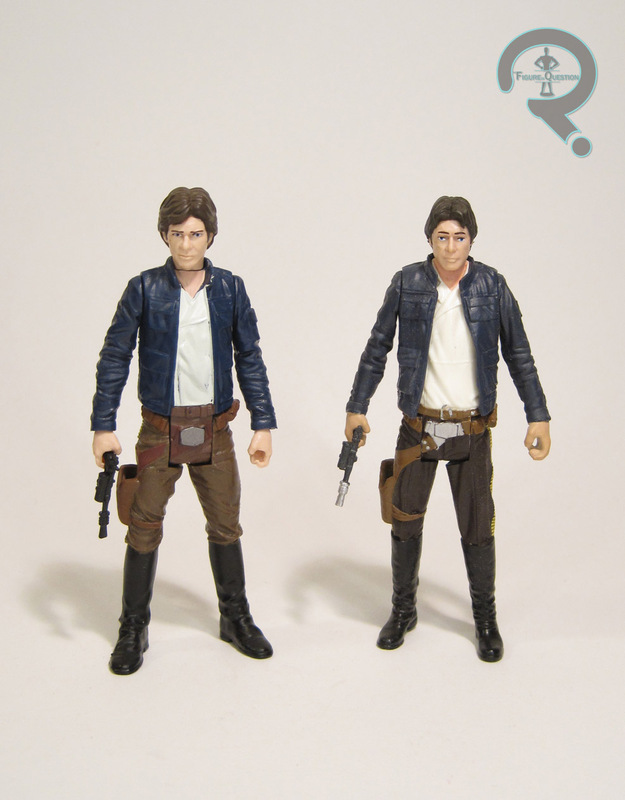 Han was released as part of the second round of Galaxy of Adventures figures, which started hitting stores just after the new year. All of the figures in this line are reissues of prior offerings, most of them pretty recent. Han mixes things up ever so slightly, not by being a new figure, but by being a slightly older one than most of his pack-mates. Rather than the post-Force Awakens product of most of the line’s sculpts, this one is a Saga Legends release from 2015. Somewhat surprising, since we got a Bespin Han figure from the Last Jedi line, but that one wasn’t a great sculpt, and this one was always a little difficult to find so yay, I guess. 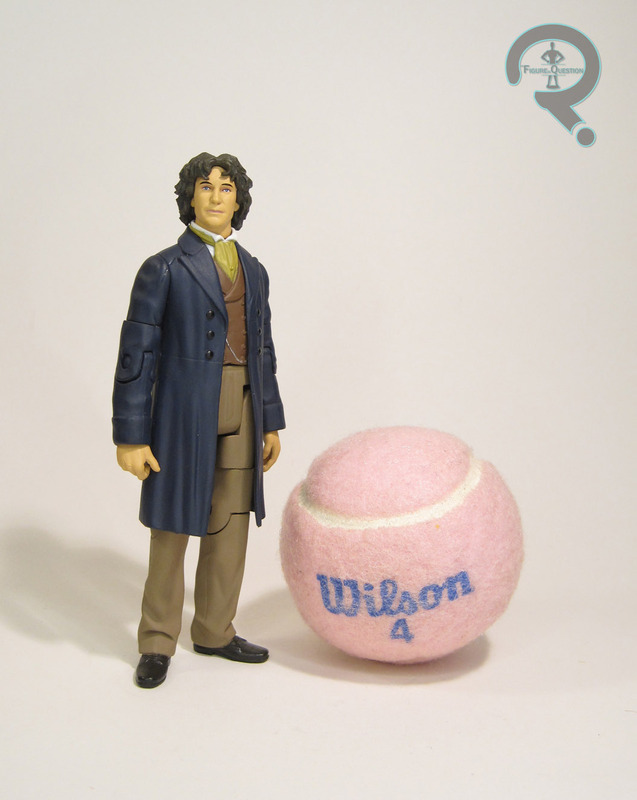 The figure stands 3 3/4 inches tall and has 5 points of articulation. His sculpt predates the move to ball-jointed necks for the heads, so just a cut-joint on this guy. It hurts his posability a little bit, but on this style of figure, it’s not a huge impact. The sculpt is actually a pretty nice one. 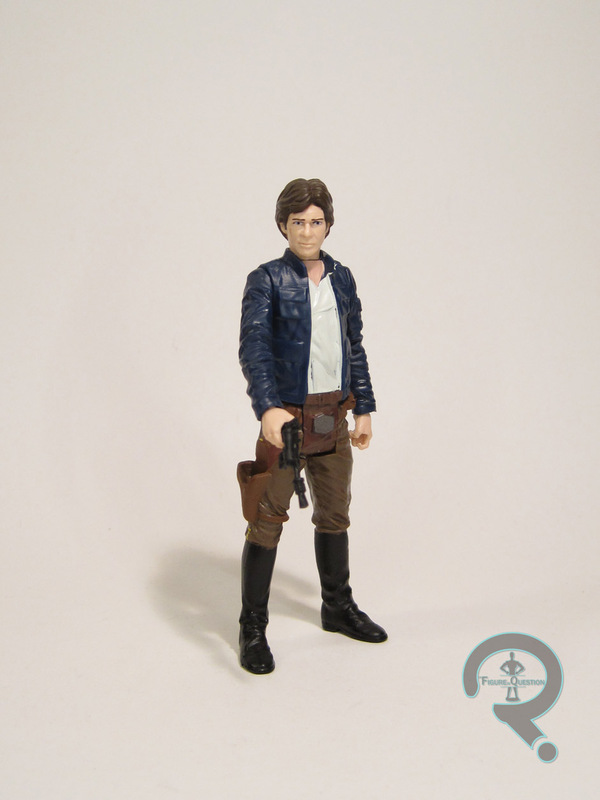 Of the lowered-articulation figures, this is definitely the best younger Han Solo. The likeness on the head isn’t a spot-on Ford likeness, but it’s still one of Hasbro’s better attempts. The figure also has a very easy time staying on his feet, which is always a definite plus for a Star Wars figures. On a whole, despite being a slightly older sculpt, it’s a much better offering than the TLJ Bespin Han sculpt. The paint work on this figure is pretty basic, but pretty decently applied, and a good match for his colors from the film. 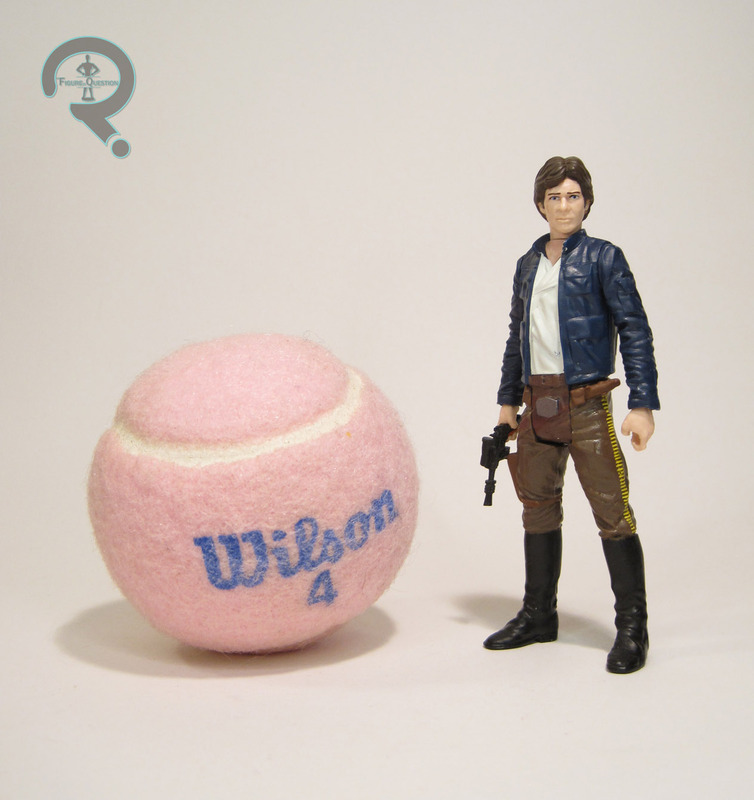 Han is packed with his signature blaster, which can be held in his hand or stowed in his holster. I wasn’t collecting Star Wars figures regularly when the Saga Legends version of this guy hit, and he was kind of rare, so I never saw one. I did my best to make due with the Last Jedi release, but it wasn’t as good a figure as I’d hoped. While the Galaxy of Adventures stuff hasn’t largely been up my alley, I was definitely happy to see this guy crop back up. He’s a nice figure, and will definitely be my default Han on the shelf for the time being. G.I. Joe is a franchise of change. Well, it was, anyway. Beginning in the late ’60s, when it became unfashionable to be selling war toys, and the line had to be rebranded as “Adventure Team,” the brand became rather comfortable with re-formatting itself to suit the times. In the early ’00s, after a decent run with a relaunch of the ARAH line, it was time to re-brand again. In an effort to fit in more with the anime-influenced, sci-fi-heavy market of the time, Hasbro created Sigma 6, perhaps one of the most divisive incarnations of the brand in existence. Either you love it, or you despise it, with very little room between. Some of the changes to beloved characters drew this divisiveness out even more, and today’s focus, Firefly, was at the center of some of that conflict. Rather than the clear cut Cobra saboteur of the ’80s, he was a member of the Joe team, with a character arc that amounted to more than the line “Cobra saboteur.” How could this be? They were killing the line!… You know, apart from the whole running for another year and a half after this figure’s release, and giving Hasbro the liquidity to launch the 25th Anniversary line and get the movie financed. But yeah, it killed the line. Let’s look at this awful thing that killed the line. 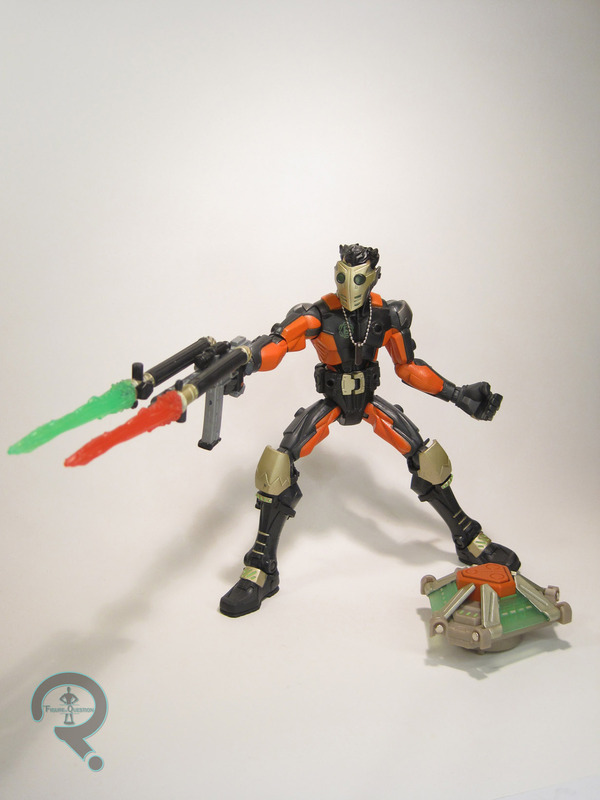 Firefly was released in the second Soldier Wave for the 2006 line-up of Sigma 6 figures, as the assortment’s one debut character. Like most of the line, he’s based on the character’s appearance in the corresponding cartoon, albeit filtered through a slightly different stylization. The figure stands 8 inches tall and he has 25 points of articulation. Firefly’s sculpt was all-new to him, though it definitely shared more than a few stylistic elements with the various other Sigma Suit-sporting characters from the line. Stylized as he may be, there are still a lot of really fun sculpted elements mixed in throughout this guy’s sculpt. I love the differing textures on the various parts of the suit, as well as the fact that Firefly’s been given a distinct build when compared to the rest of the team. I’m also still a fan of the cool little flip-up communicator that every team member had built-in; it was such a fun little touch. Firefly also has one of my favorite headsculpts from this whole line; that evil smirk of his just exudes so much character, and is just so on point for him. The modular nature of Sigma 6 was a pretty big selling point for the line, and most of the early figures have pretty involved costume pieces. As a Soldier release (meaning he was at a lower price-point), Firefly had less pieces than some, but he was still pretty jam-packed. He had a mask, web-gear (missing from my figure), belt, elbow and knee pads, and a set of dog tags, all of which add-up to a very unique looking figure. By far, my favorite part is the mask, which has a very distinct flair to it, and sits so perfectly on his head. In addition to the accents to his uniform, Firefly was armed with a nifty looking sub-machine gun (with a removable magazine and everything), plus two lightsaber-inspired torches, and a land-mine/trap gizmo. The trap is kind of goofy and hard to use, but the gun is awesome, and the torches can be inter-locked with it for a different configuration, or the flame effects can also be removed and attached to the gun’s barrel. There are a lot of play options here, to say the least. 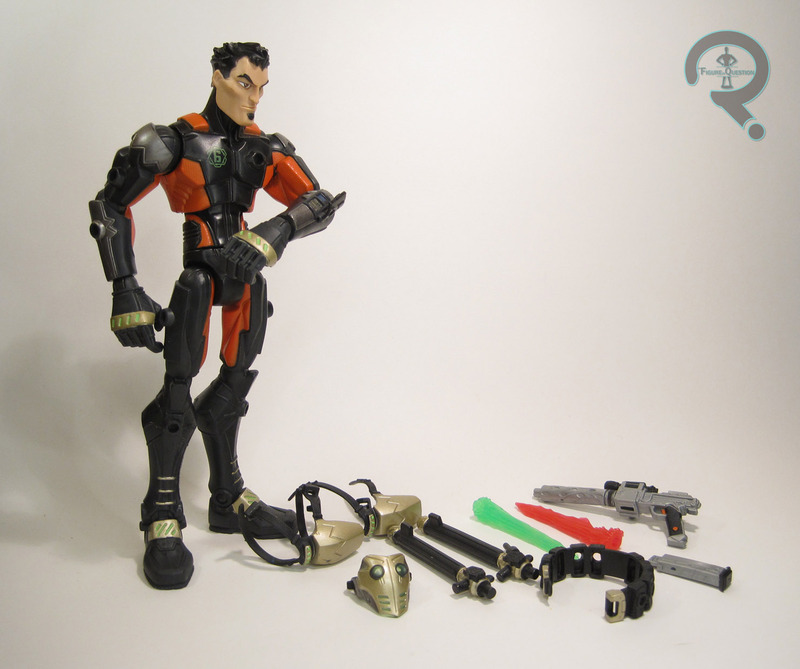 Sigma 6 was a concept I loved so much, but one I never was able to actively collect when it was new. Firefly is a figure I admired from a far for quite some time before finally being able to add a mostly complete sample to my collection late last year, courtesy of House of Fun. There’s so much I love about this figure, and he perfectly encapsulates everything that was so great about this line. He’s a fun re-vamp, a fun design, and just a generally fun toy. And he most decidedly did *not* kill the brand. That came later. Whatever the case, I’m glad to finally have one of my own, and he really is pushing me to get more of these figures. As good a reputation as the Marvel films have, some of them (Phase 2 in particular) have had a recurring issue of less than stellar antagonists. Black Panther was a fantastic example of the Phase 3 drive for better crafted foes, and it delivered in spades. Both the tortured and extreme Killmonger and the manic and excitable Klaue were excellent additions, but one of my favorite parts of the film was the bombastic M’Baku. One of the earliest Black Panther foes, M’Baku (originally known as Man-Ape, a name that hasn’t aged so well) was reimagined a bit for the movie. Most of the basic characterization is the same, but he’s no longer a strict antagonist, but is instead an unlikely ally. It was a turn I very much liked, and so did quite a few other audience members. Certainly enough to warrant him getting a figure at the very least. M’Baku is, unsurprisingly, the Build-A-Figure for the “M’Baku Series” of Marvel Legends. He’s quite obviously based on Winston Duke’s portrayal of the character, specifically from the end of Black Panther, as well as Infinity War. The point is, he’s a final battle sort of an M’Baku. The figure stands 6 3/4 inches tall and he has 32 points of articulation. M’Baku is sporting an all-new sculpt, which is definitely for the best. It’s a very strong, very solid offering. No, really, it’s very solid. Like, in a heft sort of a sense. I’ve grown accustomed to BaFs featuring hollow parts and the like, but M’Baku’s construction is mostly solid pieces, which gives him a surprising weight. I’m definitely not complaining. The sculpt is a really nice piece of work; the detailing is sharp and accurate to the movie. The head sports a decent likeness of Duke. It’s not as strong as, say, the Andy Serkis likeness for Klaue, but it’s still very good. The body sculpt has a ton of layering to it, and I particularly like how well all of the fur turned out. There’s always room for things to go very bad in such areas, but that wasn’t the case here. M’Baku’s paintwork is an impressive selection of work. It’s a fair bit more involved than we tend to see from Hasbro these days, with quite a bit of accenting and weathering. Not all of it’s perfect, but it’s still quite good, and the sculpt is well accented by the subtler work. M’Baku’s essentially an accessory himself, so accessories aren’t expected, but he does still get one. It’s his staff, which seems a rather sensible choice. I’m glad it didn’t get overlooked. When Black Panther was released, I walked out of the theatre wanting an M’Baku figure. Duke’s portrayal of the character really worked for me, and I was disappointed that he wasn’t among any of Hasbro’s offerings. When news that they were going for a second dip broke, I was hoping to see him turn up, and I wasn’t disappointed. This is a very good figure, and makes good use of being a Build-A-Figure, since it allows his sculpt to be a bit more intricate than it might be otherwise. This assortment is a lot more cut and dry than the Kingpin assortment, mostly because it’s so very focussed. If you’re after a full line-up of Black Panther movie characters, it’s pretty perfect. Fortunately, that’s what I wanted, so it works out well for me. M’Baku was a good anchor for the assortment, and there’s no denying that I bought some figures I wouldn’t have otherwise in order to complete him. He feels worth it. Of the singles, Klaue is the definite star, but the Dora Milaje and Killmonger aren’t far behind him. Even the Panther variants all seem decent in their own right. I see this being a well-performing assortment. What good is a toyline without some army builders? You know, it’s usually the bad guys that get the army building fun, but every so often the good guys get the chance to get in on the game too. Not super frequently. Though prominent players in Black Panther, we didn’t get very much toy coverage at all of the Dora Milaje, Panther’s squad of body guards. We got their general, Okoye, as a Build-A-Figure, and Nakia in one of their uniforms, but that was really it. Fortunately, it’s Hasbro’s aim to fix that issue in spades. 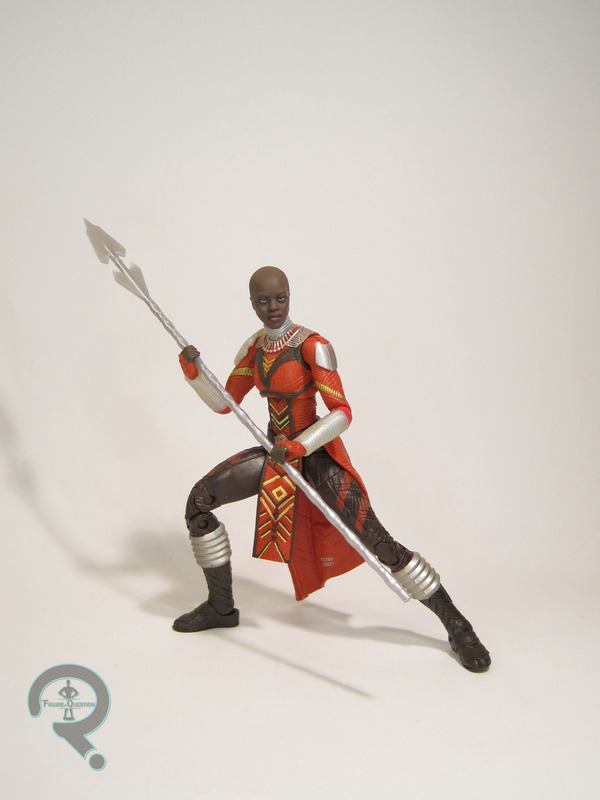 The Dora Milaje is figure 6 in the M’Baku Series of Marvel Legends, and I do believe has the notoriety of being our first proper MCU army builder in this scale (unless we’re counting the Hydra heads that came with Red Skull). 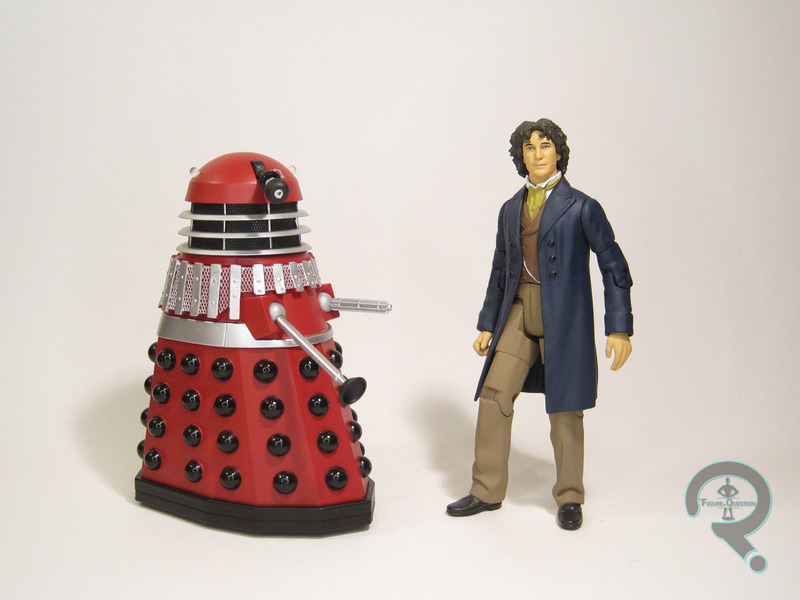 The figure stands 6 inches tall and has 27 points of articulation. 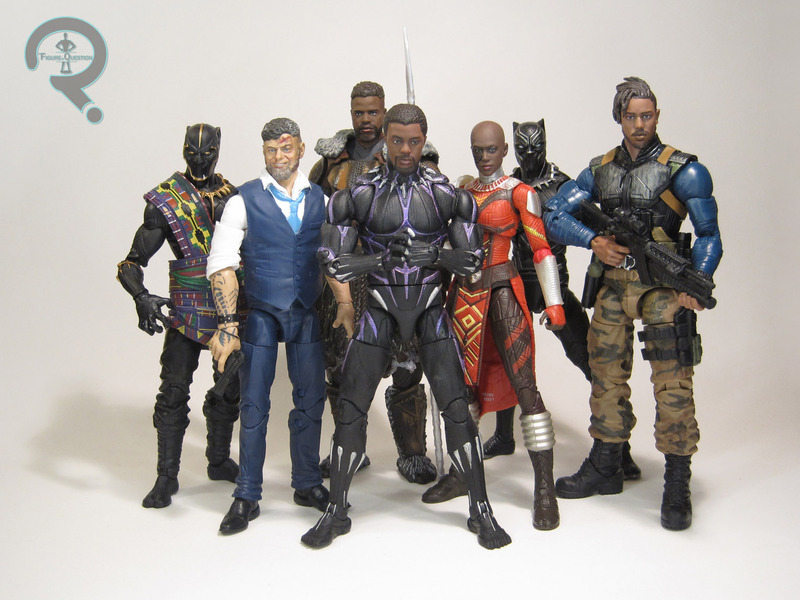 Like the CW Black Panther in this assortment, the Dora Milaje is heavy on the parts re-use; from the neck down, this figure’s sculpt is identical to the Nakia figure from last year. Given a) it’s the same suit, and b) that was a pretty fantastic sculpt, you’ll hear no complaints from me on that front. The body is still one of the best bodies out there in terms of posability, and I’m still very impressed by what Hasbro was able to pull off with it. In order to keep things fresh, and further facilitate the whole “army building” thing, the Dora Milaje includes not one, not two, but three all-new head sculpts. The first sculpt (seen in the photo at the top of this review) is particularly notable, because it’s actually a named character. Yep, that’s Ayo, the head of T’Challa’s security, and the Dora Milaje with the most appearances under her belt, showing up in Civil War, Black Panther, and Infinity War. The head sports a solid likeness of actress Florence Kasumba, and seems to really get that stern expression of hers down. The other two heads don’t appear to be any particular members (at least not ones I could spot when I re-watched the film in anticipation of these reviews), but are rather meant to check a few different boxes, in order to fill up the ranks a bit more quickly. I really like the calmer of the two; there’s a very lifelike quality to it, which helps it fit in very well with the rest of the more recent MCU stuff. The teeth-baring one, I’m a little bit less of a fan of, because I think it just looks too cartoony when compared to the other two sculpts. Still, it’s certainly not a bad offering. 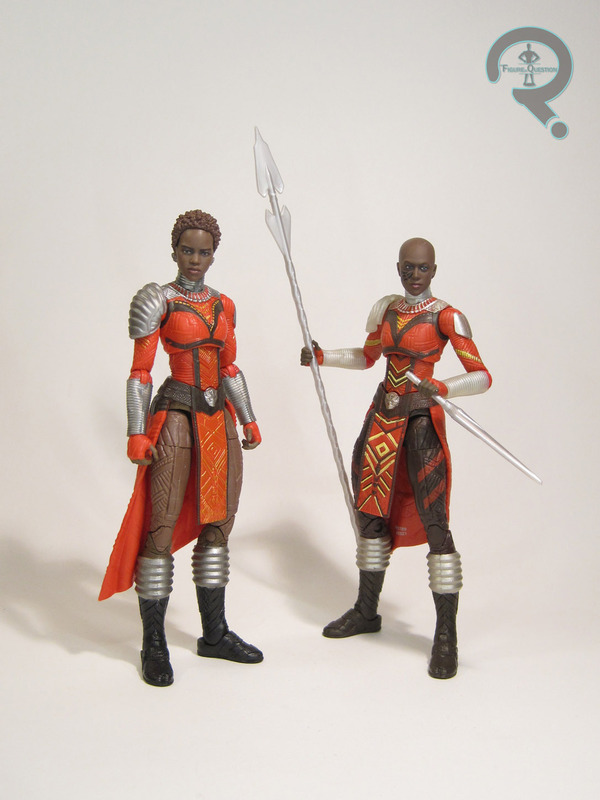 Though the Dora Milaje figure may be using the same body as Nakia, the paintwork on it has been greatly improved. There’s far more detailing, especially on the red sections of the uniform, and, as a whole, the figure just looks more finished. Nakia wasn’t bad, but this is better. In addition to the two extra heads mentioned above, the Dora Milaje includes a spear, Nakai’s hoop blade weapons, and a smaller bladed weapon, as well as the last piece of M’Baku. With all of the other figures shown off for this line-up, the Dora Milaje was one that kind of slipped under my radar. I already had Nakia and Okoye, so I had my bases covered, I thought. But, I wanted M’Baku, so why not give this figure a shot, I thought. Well, I’m very glad I did, because this figure takes everything I loved about Nakia and builds on it, making for a downright awesome figure. And, we got an Ayo figure out of it to boot. Pretty nifty if you ask me! 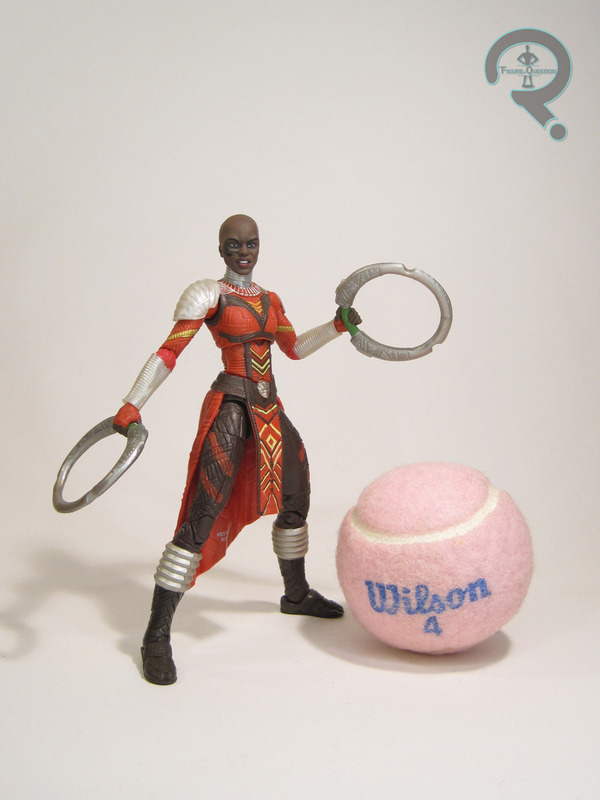 The Dora Milaje was purchased from my friends at All Time Toys. If you’re looking for other toys both old and new, please check out their website and their eBay storefront. Despite being a legacy character, whose whole gimmick is a title that’s been passed down for centuries, when it comes to Black Panther merch, T’Challa seems to get all of the love (Avengers BC Panther’s Minimate release not withstanding). But it’s okay, because we’re finally getting to see T’Challa’s father, T’Chaka, in his sick ’90s-era Panther get-up! How about that? 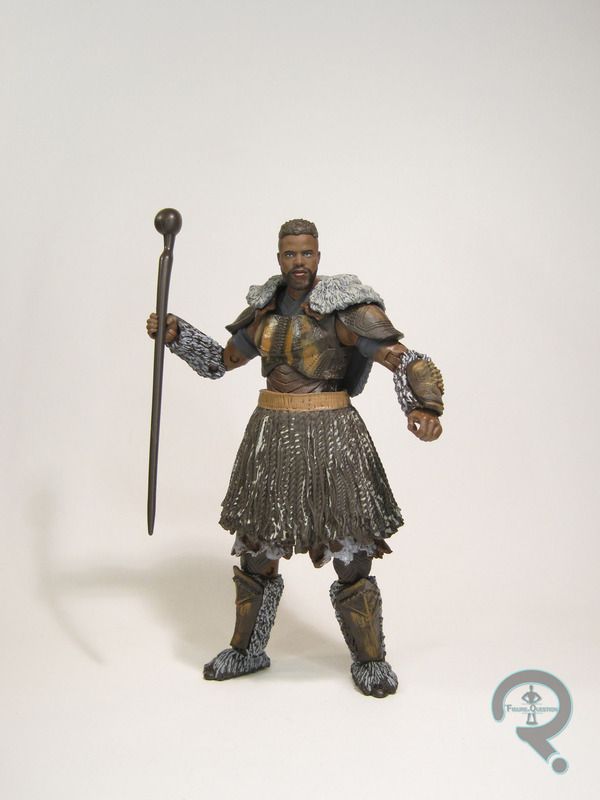 T’Chaka is figure 5 in the M’Baku Series of Marvel Legends. He’s our third Black Panther variant in the assortment, but obviously the most unique of the three. 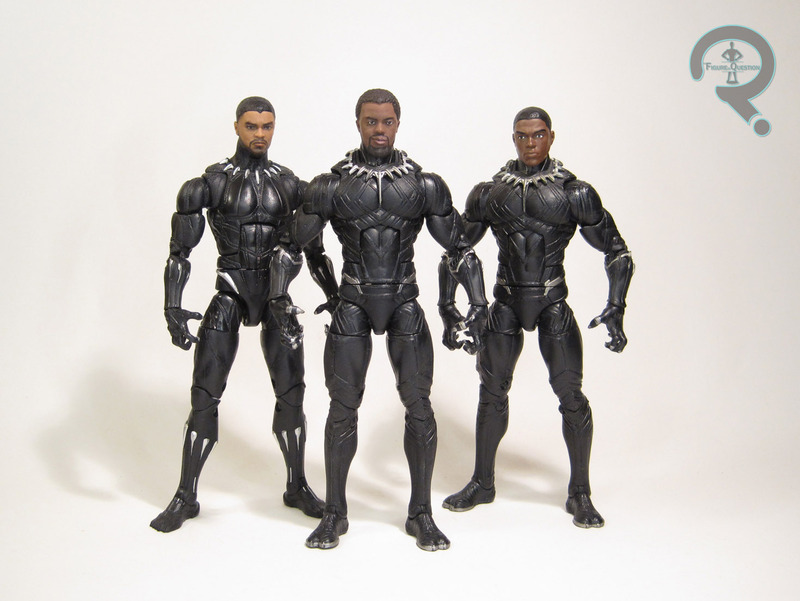 Though we see T’Chaka at several different parts of his life, this figure depicts him in his prime, fully suited up, as we see him in Black Panther’s opening scene. 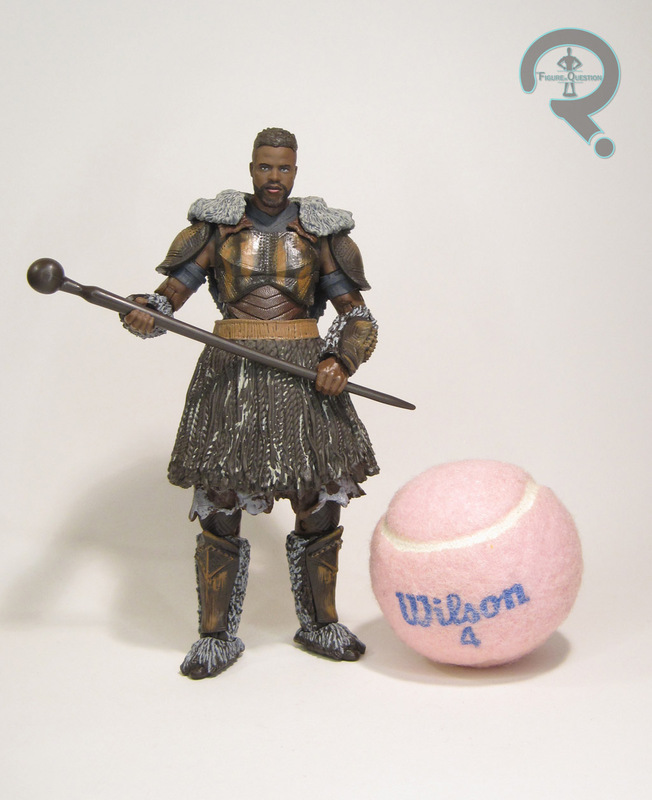 If you’re gonna make a T’Chaka figure, this is the most obvious choice for his look. The figure stands 6 1/4 inches tall and has 32 points of articulation. T’Chaka employs a fair bit of re-use, with the torso, arms, hands, and feet all hailing from the Civil War Panther figure. However, if you look closely at the costume in the movie, you’ll notice that the two actually did share the costume, meaning this re-use is not only acceptable, it’s totally warranted. T’Chaka gets a brand-new head sculpt, sporting his slightly changed mask, as well as a new set of legs to show off T’Chaka’s looser fitting pants. It was the ’90s; everyone was sporting baggy pants. 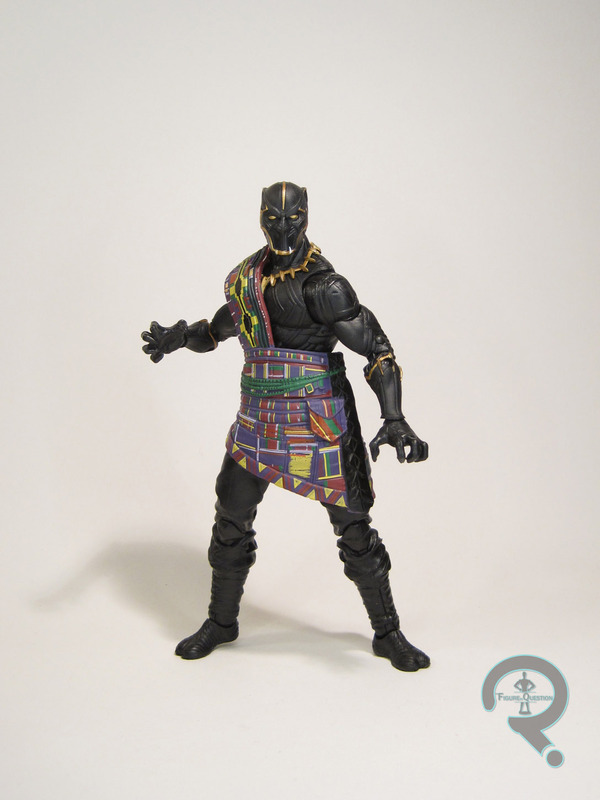 It’s all topped off with an add-on piece replicating the kente cloth that T’Chaka has draped over his shoulder. It’s one of the most distinctive features of the design, and helps to further this figure from the Civil War Panther. It’s a little on the bulky side, but not terrible, and it’s also removable, so you can create a more tactical T’Chaka, should you be so inclined. T’Chaka’s paintwork is pretty solid stuff. The accents on the costume have changed from gold to silver, which nicely sells that it’s a different person under the mask in a very subtle fashion. The color work on the kente cloth is quite impressively handled, and surprisingly clean and orderly. I was definitely expecting more slop. T’Chaka includes no accessories of his own, beyond the piece for M’Baku. It’s a shame we couldn’t get an unmasked head for him (or, if they wanted to be really generous, two), especially given the parts re-use. From the moment I saw it on the screen, I kinda wanted a figure of this design. Obviously, he didn’t get a Legend in the first round, and when he didn’t even show up as a Minimate, I was kind of expecting not to see him, at least not in an affordable format (my days of buying Hot Toys are kind of behind me). When he cropped up alongside the rest of this assortment, I was thrilled. I wish he had some accessories, but otherwise I’m very happy with this figure. T’Chaka was purchased from my friends at All Time Toys. If you’re looking for other toys both old and new, please check out their website and their eBay storefront. Following his appearance in Captain America: Civil War, Black Panther was one of the hottest things ever. 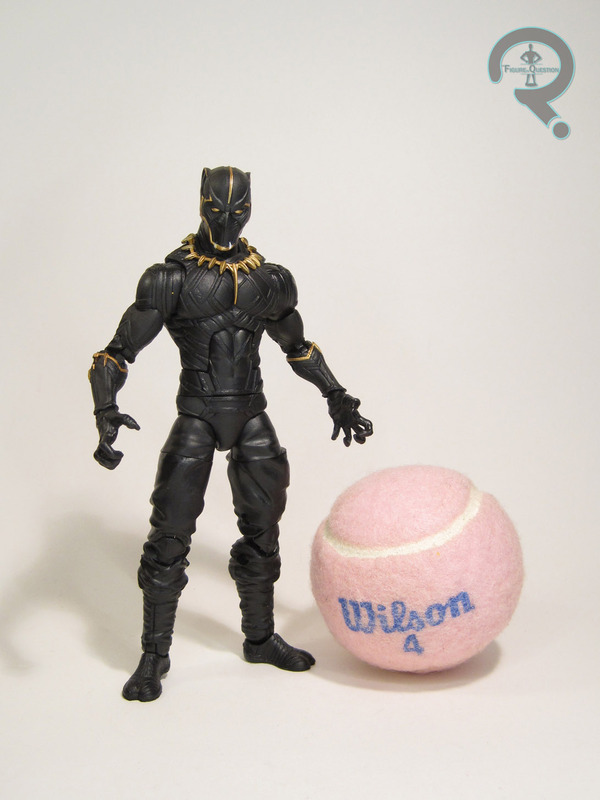 It was little surprise that his Marvel Legends release from that movie proved to be by far the most difficult to track down of the series that included him, leaving Panther fans without a figure, at least until his solo flick came along. But, of course, his main costume for the film, so if you wanted the (admittedly slightly superior) Civil War Black Panther, you were still going to need to find that figure. Until now, anyways. 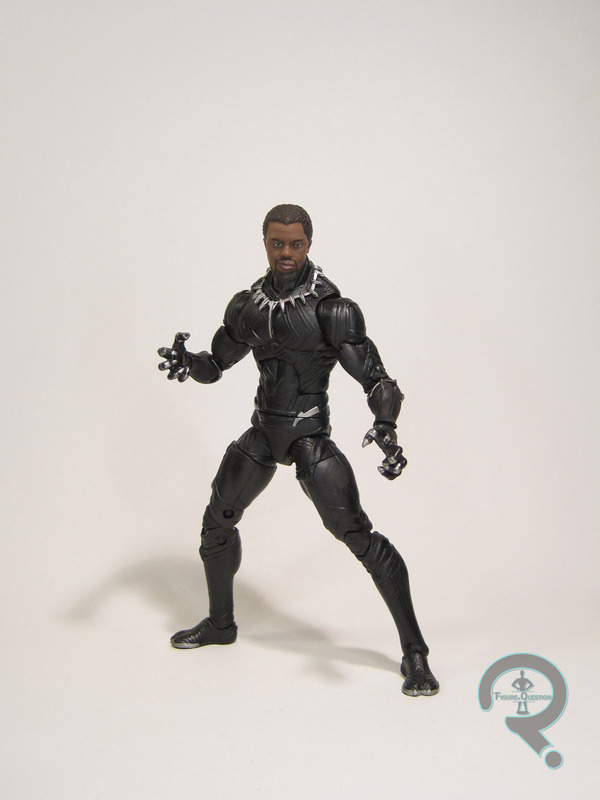 Black Panther is figure 4 in the M’Baku Series of Marvel Legends. There’s actually no name distinction between this figure and the Kinetic Energy variant, so I can foresee referring to them getting a little confusing in the long run. 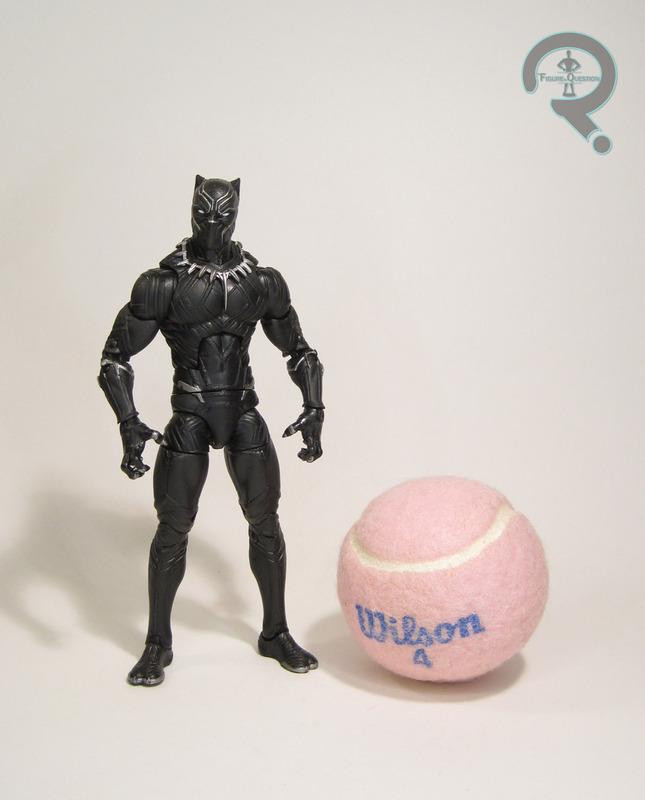 Though not his main costume, the CW design’s appearance early in Black Panther gave Hasbro enough leeway to include him in this second Panther-based assortment. Let’s cut to the chase here: this figure’s sculpt is 100% identical to the Civil War release. Same height, same articulation, same detailing. I’m not complaining, mind you, because I loved this sculpt when it was new, and I still really like it now. Sure, in retrospect the shoulder articulation is a bit more restricted than I’d like, but beyond that, it’s a sculpt that still really holds up. There are some very minor, and I mean *very* minor, tweaks to the figure’s paint. The eyes follow the sculpt a little more closely this time, and he does seem to be generally cleaner looking, but there aren’t any really intentional changes. The only true change to this figure are the accessories included. Obviously, he swaps out the Giant Man piece for one from M’Baku, but he also trades out the somewhat generic unmasked head for one that looks a fair bit more like Chadwick Bosman. I don’t like this one quite as much as the one included with the Kinetic Panther; the expression makes him look really goofy. Still, it’s better than the one we got originally. There’s not much to say about this guy. I’m not surprised by Hasbro’s move to reissue him, since the original was still tricky to find. He’s a good enough figure that he doesn’t feel out of place among his peers and the new head’s certainly an improvement. That said, I bought this guy solely to finish M’Baku, and having already gotten the unmasked head with Kintetic Panther, there’s just not much this guy has to offer me. But, like Carnage, he’s not really for me, so I guess there’s that. Panther was purchased from my friends at All Time Toys. If you’re looking for other toys both old and new, please check out their website and their eBay storefront.